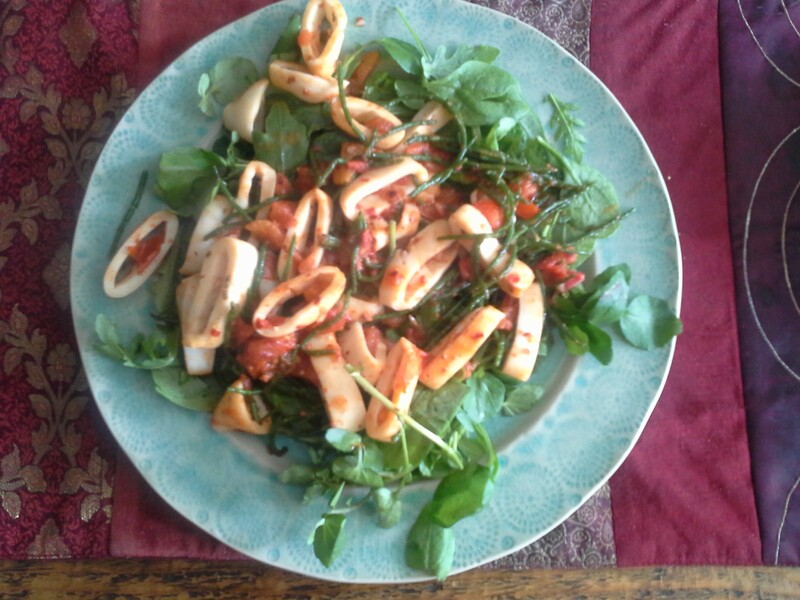 This is a squid salad- really fresh squid sauteed with garlic and red chilli, and served on a leafy salad, with am very ripe tomato thrown in at the end. A triumph. However, dinner was a massive disappointment….. So today I have tried harder to avoid all foodie disasters! 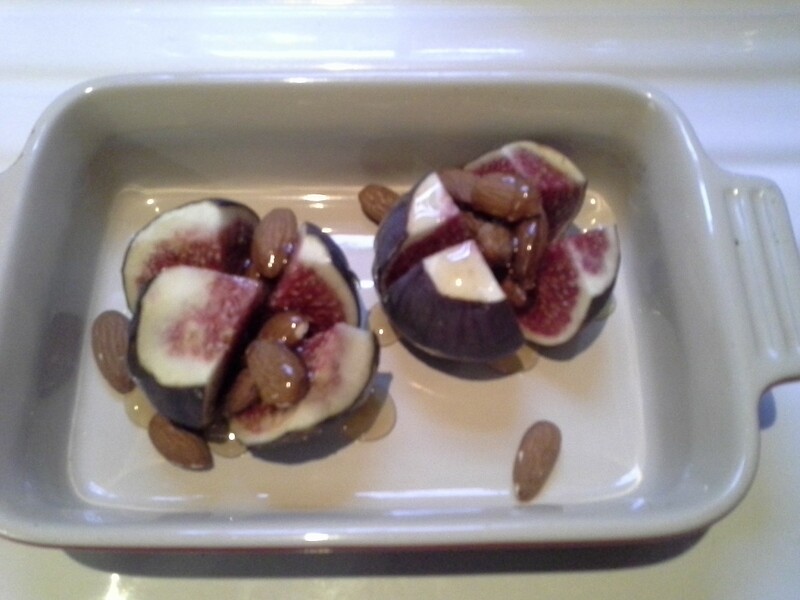 Figs, sprinkled with almonds, drizzled with honey, baked in the oven for 20mins and served with thick Greek yoghurt. Beautiful. For lunch I looked to the freezer and had some spelt ravioli, stuffed with walnuts and blue cheese that I bought some time ago from The Twickenham farmers market. They were quite nice, although a different texture to ‘normal’ pasta. 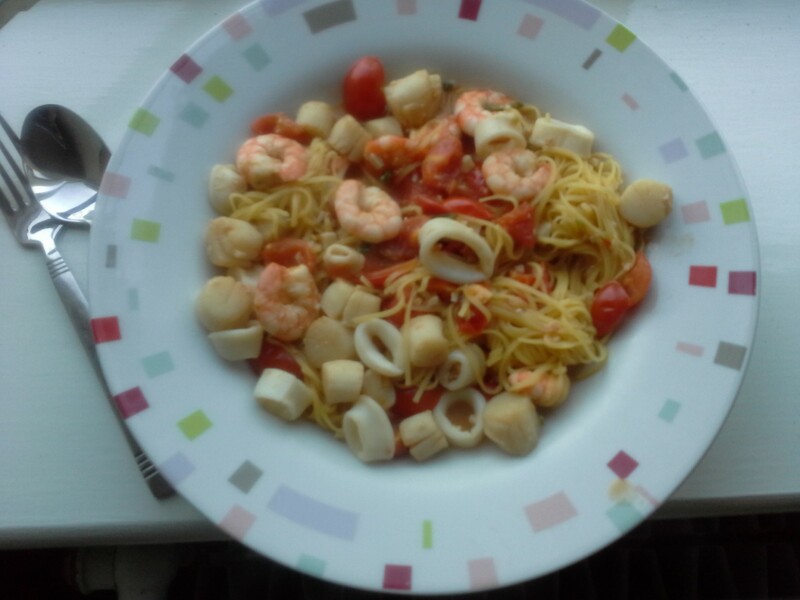 Fresh spaghetti with fruits de mer. All that was missing tonight was a good glass of wine- but I am remaining good until the end of the week. I am also on car duty to pick Colin up. I have started packing for the hols today- I actually can not wait!!! 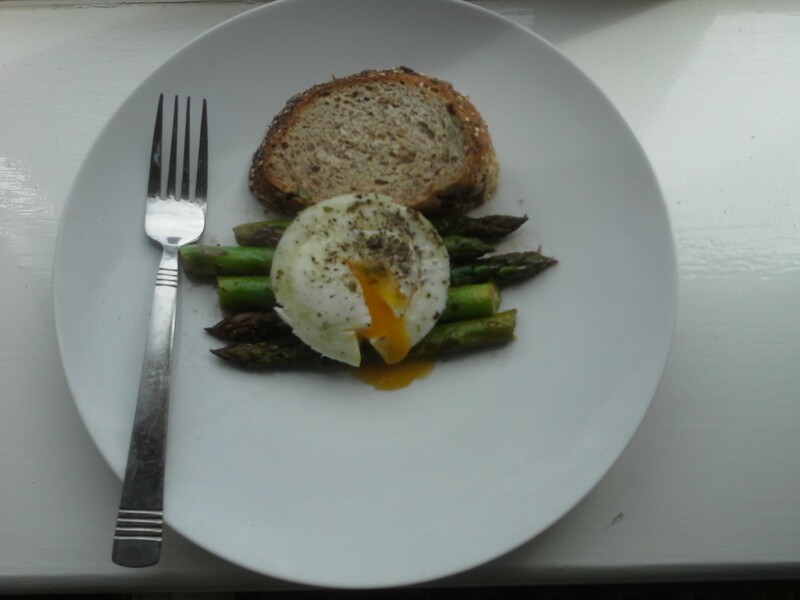 But let’s have a round up of this weeks menu…..
My day off as I was working on Sunday. I always try to make myself a lovely lunch when I have a day off on my own, and have something that I know Colin would prefer not to eat. 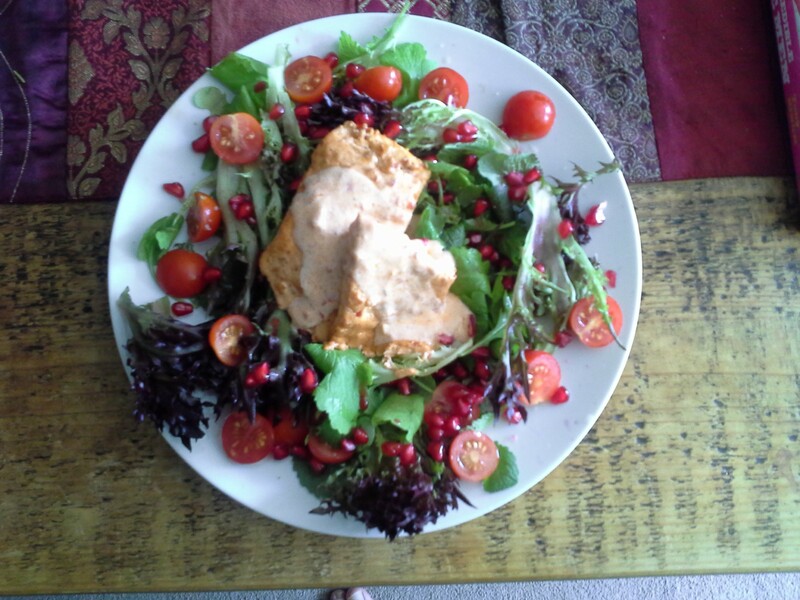 And today was an old favourite, based on a Jo Pratt recipe: harissa salmon. The salmon is marinated in Greek yogurt, harissa pasta and lemon juice and then baked in the oven. The original recipe served the fish with a taboulleh type of accompaniment with pomegranate seeds which is absolutely delicious, but I wanted to keep it light so a salad did suffice. Delicious as always. For dinner we are continuing the vegetarian theme and made a Homity Pie. You can see the recipe and a previous picture on the recipe link on the home page. I ordered some spicy Tuscan salami from Natoora which was crying out for a pizza! However, better than that was the puff pastry tart that I made instead- puff pastry topped with a little passata, red onions, chilli, fresh tomatoes, salami and some shavings of cheese (I used some mature cheddar I had in the fridge) and baked in the oven for 30mins until browned and bubbling. These kind of tarts on puff pastry are quick and easy and so versatile- there is a gorgeous Nigel Slater recipe with caramelised onions and blue cheese which I would never get tired of eating! Scrummy! As well as the spicy salami I had bought some ordinary, Milano salami, which I sauteed with some garlic and red chilli, added some tinned tomatoes and served with spaghetti. Comfort food of an Italian variety. It was Colin’s day off today so he assumed chef duties!!! 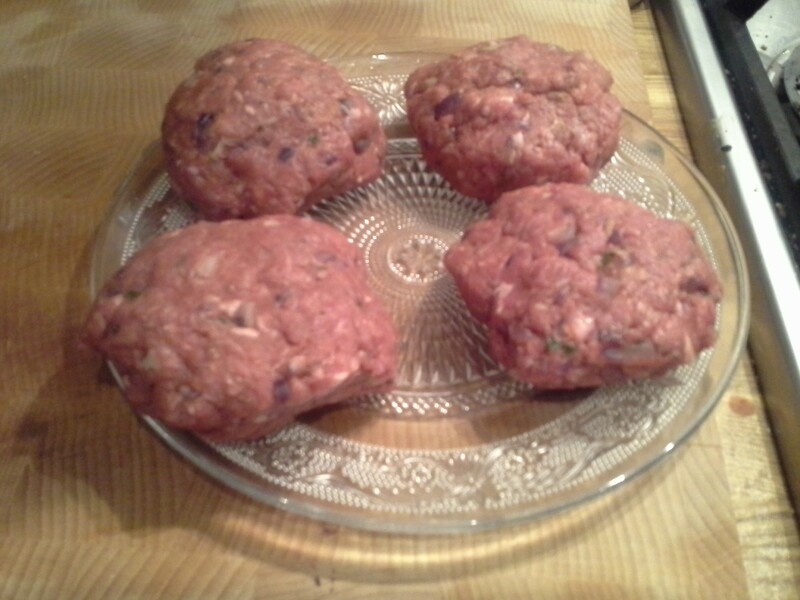 The recipe is a closely graded secret, but, it was delicious! Not too spicy or hot, well seasoned, and cooked so well that the burgers were really juicy. Salads were prepared too, as well as some spicy potato wedges, plates were cleared and Tums were filled. Colin is back on form!!! Today was a great day at work as lots found a nice surprise in their payslip due to some payroll problem that was fixed- squeals of delight were heard at work, for the very first time! Oh, and still no drinkies for me, but we are now in count down until Friday when a cold beer may break the fast, or will it be a g&t, or a glass of vino- decisions, decisions, decisions!!! Well, alcohol-free August is going remarkably well! Half way through the month and I am feeling cleansed and full of energy….. well actually that is not true but I am sure it must be good for me!!! Dinner this Saturday night was delicious. 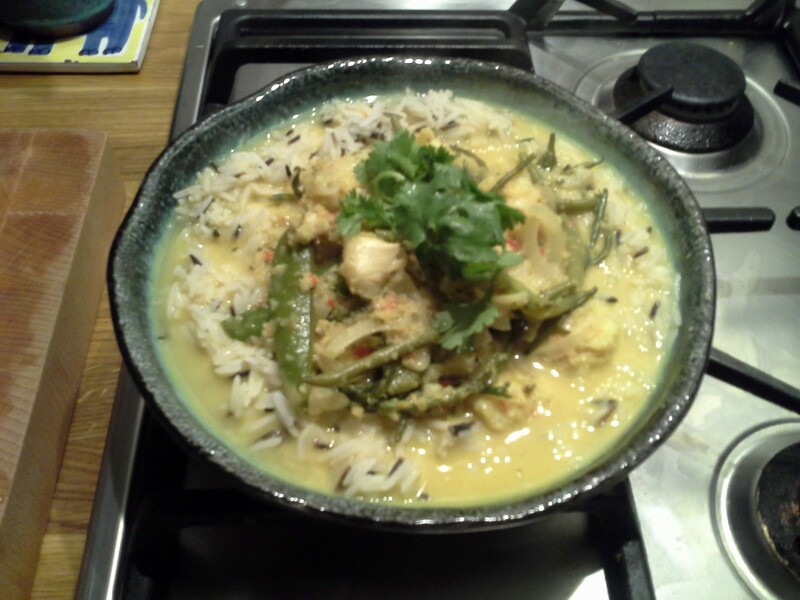 A fragrant fish curry, which I believe is one of my best. Pop all the paste ingredients except for the water into a food processor and whiz into a paste. Add the water a bit at a time until the paste is quite smooth: you might need a little more that in the recipe. Heat some oil in a wok, add the paste and stir for 2-3 mins, until fragrant smells are in the air! Add the coconut milk and fish sauce and bring up to a simmer. Add the sugarsnap peas and fish and simmer for about 10mins, or until the fish is cooked through. Add some water if the sauce becomes too thick. Serve scattered with the spring onions and coriander, and a little spritz of lime juice. It is lovely to eat something so light and full of strong flavours, which only takes about half an hour to cook from beginning to end. Delicious. On Sunday I made a tagine, based on the chicken and artichoke tagine in Claudia Roden’s book Arabesque. We used to have this alot, but not so much recently- and the next time I’ll take a photo and share the recipe! A busy, busy week at work which has called for some comfort food in the evening- but still no drinkies!!! Lots of non-alcoholic drinkies though: we are becoming quite big fans of all Fentimans drinks- pink lemonade, ginger beer, dandelion and burdock, very refreshing when super cold. The week started with a chicken breast…. I stuffed the chicken breast with some really strong dolcelatte piccante, wrapped it in bacon and baked in the oven for 30mins. It was lovely- the flavour of the stilton really complemented the chicken and bacon, and gave it an intensely savoury flavour. 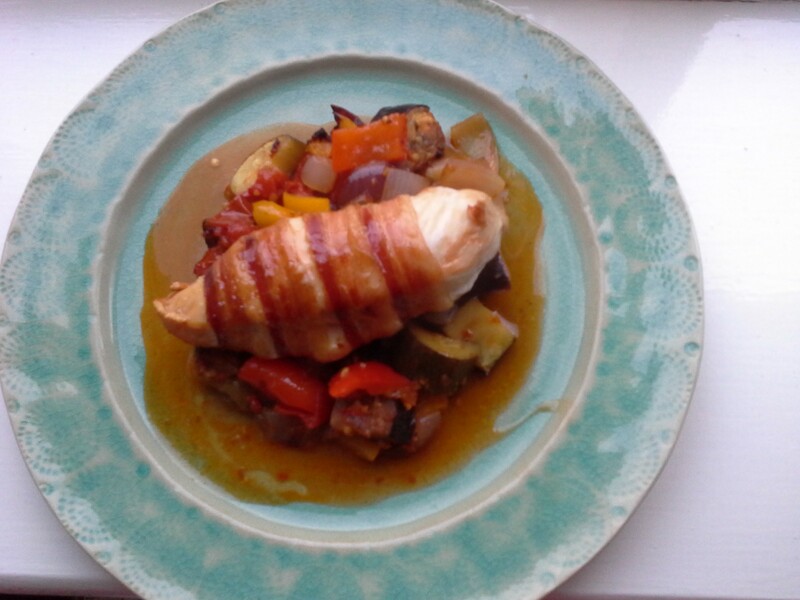 I served it with lots of roasted Mediterranean veggies, and the juice from the chicken and the vegetables. Delicious! I had some really good mince beef from the weekend farm shops so Wednesday called for some meatballs. I didn’t add much more than some salt and pepper before making them into meatballs, and then baked them in the oven for 20 mins, just until they started to get brown. I prefer the meatballs to be as meaty and unmessed about with. The sauce was a tomatoey one, with a tablespoon or two of harissa for added kick- and the balls were added for the final 15mins to bring all the flavours together. A French-Thomas classic! Laziness kicked in on Thursday so shop bought ravioli were bought- Italian sausage ones- although I did reduce down some tins of tomatoes, garlic and chilli for a sauce. Friday was my late night at work so no dinner for me…..
A full weekend in ahead, but the fridge is full of goodies- a big Natoora delivery arrived this evening!!! The farmshop was ok- I wanted to love it but I can only say like. The building is lovely and it is all well presented. But alot of the products on offer are available in my Waitrose and I wanted to be wowed with new things! Saying that, what they did have from local suppliers was good- cheese, alot from the Isle of White Tomato farm, jams and bread. On the way home we made a small detour to Laverstoke Park. Now we are massively spoiled in Twickenham as we have their shop on the high street, but it was nice to see the farm, and we picked up some good looking veg. Too tired to cook can you believe it, and curry was being yearned for by Colin, so Minar in Hampton were called and delicious food arrived 45mins later. 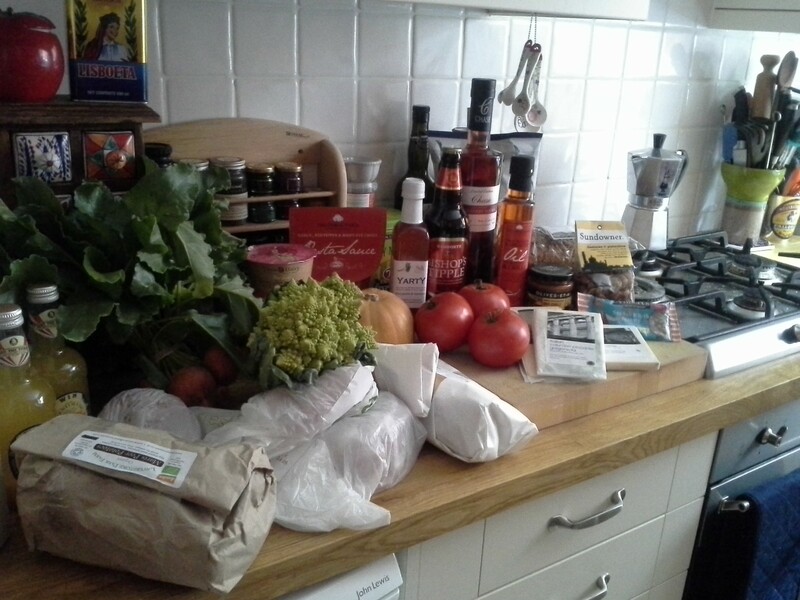 So the cooking of the haul from the farmshops was delayed until after work on Sunday. I had bought a dry-aged wing rib of beef, and I took a lot of care to cook this perfectly, keeping it pink in the middle and letting it rest for 20mins. It was gorgeous- very much worth the cost. This was served with some roasties, some baked golden beetroot and a stir fried romanseco with a little garlic, chilli and lemon juice. Lovely! PS it was crying out for a glass of Burgundy, but a chilled ginger beer (non alcoholic of course) working well too! Isn’t it funny how sometimes you make food for your nearest and dearest, sure they will love it, and they barely touch it. Then other times when you are concerned and approach with caution, yet empty plates? Well Monday night, I am delighted to say, was one of the latter!!! Sprinkle the onions over the pastry. 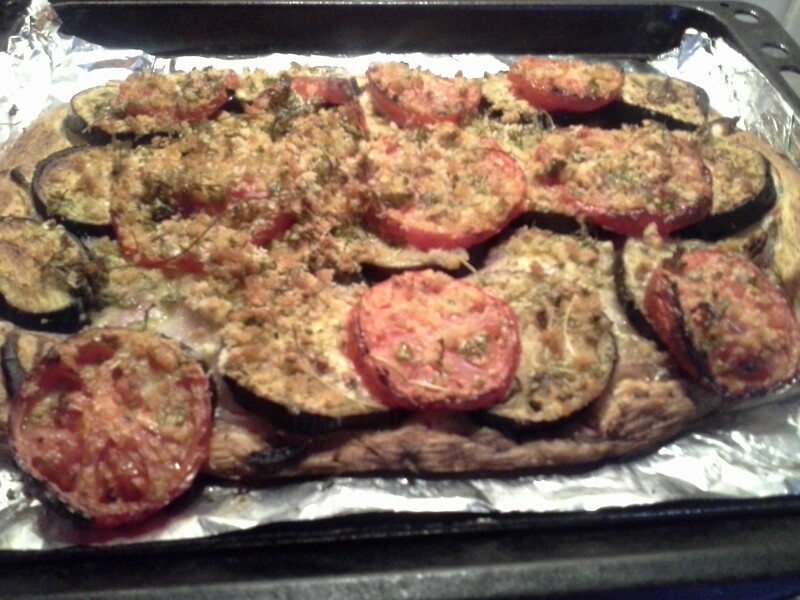 Place the aubergine and tomato on top, overlapping. brush the aubergine with a little olive oil where they are visible. in a small bowl mix the cheese, breadcrumbs, parsley and garlic. Drizzle in about 1tbsp olive oil and mix well. Sprinkle all over the vegetables as evenly as you can. bake in the oven for 20 mins or until bronzed all over. serve with some green salad, and some new potatoes if you fancy it. This would be lovely with a chilled glass of sauvignon Blanc- maybe in September! 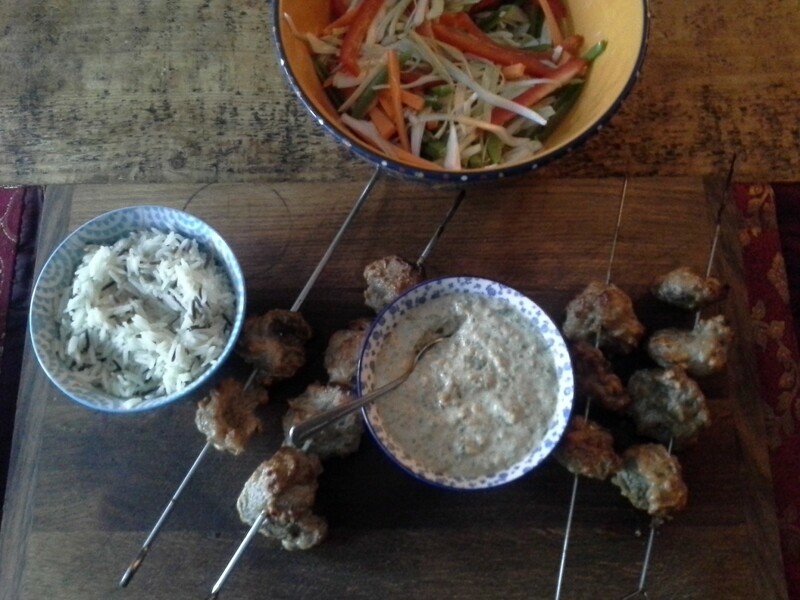 And then on Tuesday I have the former problem- I was positive Colin would love a pork satay as he loves all the individual ingredients. I found what looked like a good recipe and gave it my best shot. I quite liked it, would have liked it a little more spicy, but liked the crunch of the peanut satay sauce and the juicy pork. Colin, however, moved it around the plate for a while and said the look of it was putting him off 😭😭😭. It just goes to show, you can never tell! He did, however, eat loads and loads of the accompanying salad- a raw mix of sugar snaps, carrots, white cabbage and onion, and rice. So he did not go to bed hungry, I promise you. The rest of the week has seen some old favs- fishcakes and a lovely spaghetti bolognaise. 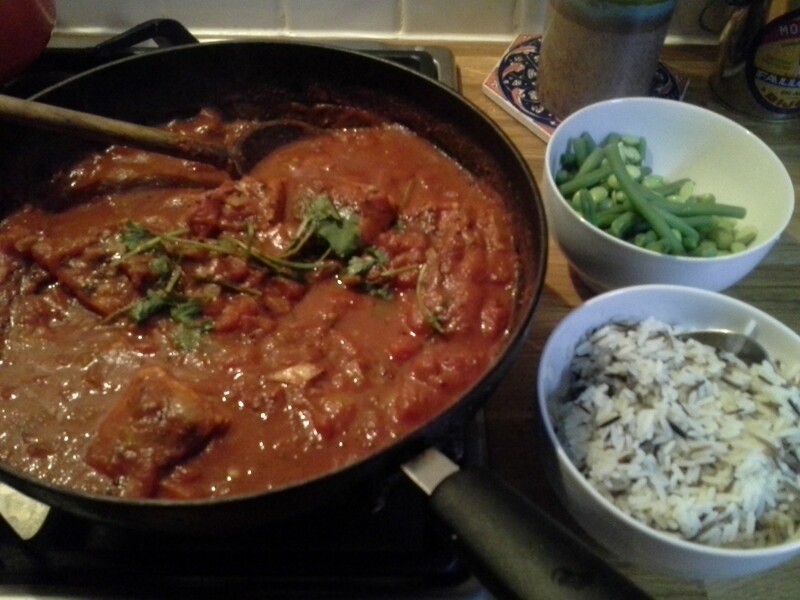 And a late night where Colin made a curry which I took in to work for my dinner, and lovely it was too. We are off on our hols to Umbria at the beginning of September so we have made the amazing step of having a healthy month in preparation. I have actually started a little early on 31st July, with Colin joining me on 2nd August. There are many who think I am mad, and many who think I won’t make it for a whole month- I partly agree with them!! !- but try I will. The vision of a glass of wine by the pool in our villa on 31st August will keep me going! August so far has seen 2 late nights so only 2 proper meals cooked so far. On Friday I decided to make a roasted veggie lasagne as it has been absolutely ages since I made one- in fact I am not certain I have ever made it for Colin. 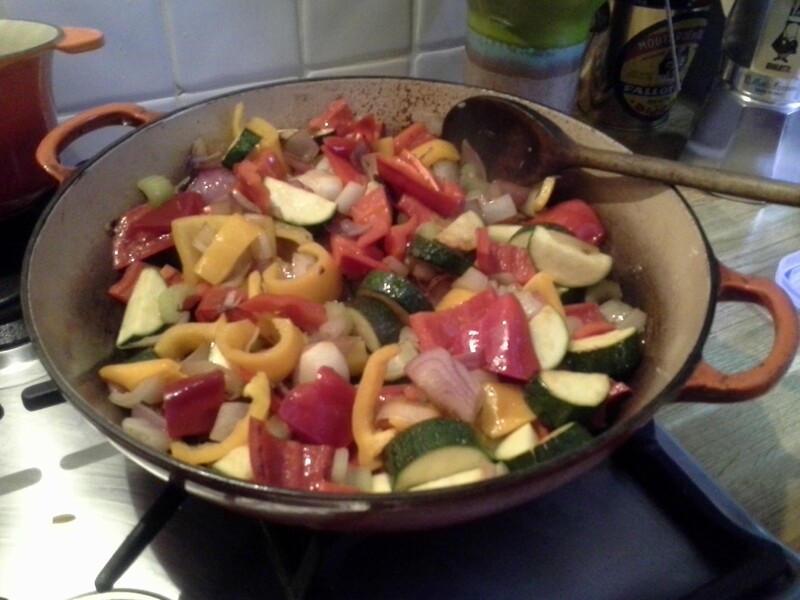 As you can see from the photo it was packed with lovely veg- peppers, onions, courgettes, tomatoes, chilli, celery. I soaked the dried lasagne sheets in water before using which made quite a difference in the amount of time it took to cook. 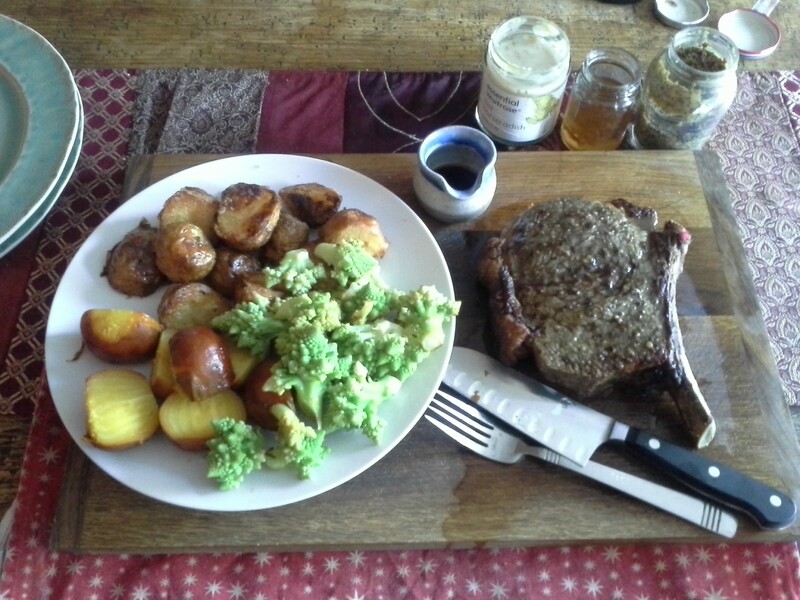 Quite tasty, and Colin almost ate it all…..
Sunday has been my day off and I have snuggled down for a lovely restful day, full of lovely food. 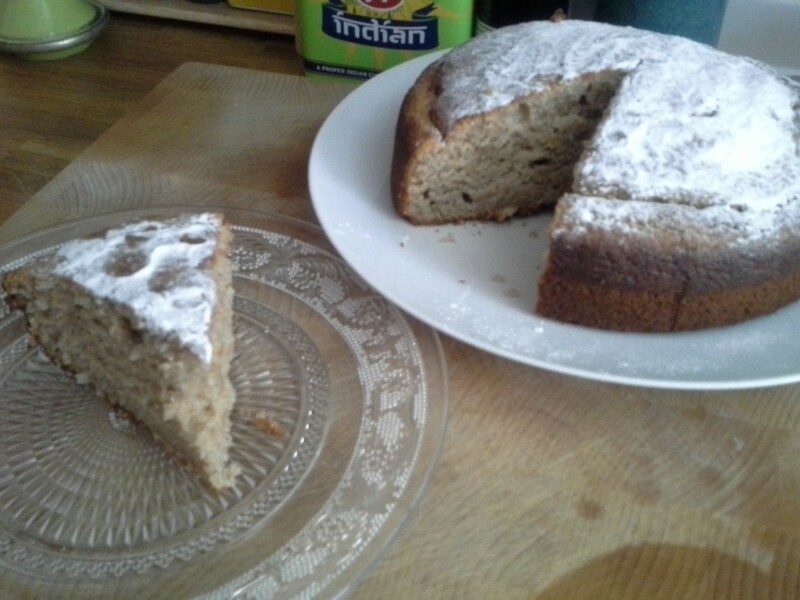 This cake was a yoghurt and cinnamon cake made from the Rachel Allen book, Cake. It is moist and lovely with a coffee in the afternoon. I am planning on having the rest with Greek yoghurt and berries for my breakfast throughout the week ahead. A quick, easy and delicious treat. dinner was a braised salmon from Ottolenghi’s book- tomatoey and spicy with mustard seeds, cumin seeds, fennel seeds, and a little turmeric. Not a usual Sunday night dinner but very satisfying and filling. Recipe can be found in the recipe section of the blog!